Why is a Motorcycle Lawyer? A motorcycle lawyer is a personal injury lawyer who specializes in motorcycle accidents. A motorcycle accident is usually the result of negligence on the part of a one or more individuals and a motorcycle lawyer will be retained when the negligent actions of one part results in sever injury to the motorcyclist or his or her motorcycle or other property. 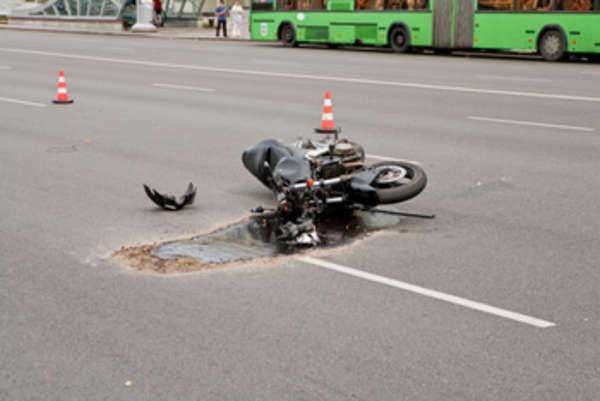 A motorcycle lawyer will represnt a client in personal injury accidents against the negligent party who caused the accident or against a 3rd party, such as a manufacturer, who may have contributed to the injury. Why do I need a Motorcycle Lawyer? If you have suffered an injury do to a motorcycle accident and you are the plaintiff seeking money damages for medical expenses, lost income and special damages you will definitely want the help of a motorcycle lawyer. The public perception of motorcyclist is that they are irresponsible, social deviants often associated with biker gangs. A motorcycle lawyer has the experience and knowledge to counteract these allegations. Juries might conclude that, simply because you were driving a motorcycle, you were a negligent party. It is the motorcycle lawyers job to rebut these presumptions and present you as a responsible member of society. The defendant in a motorcycle accident will be represented by his or her insurance company. The insurance companies lawyers only job is to represent defendants and the insurance companies in litigation involving motor vehicle personal injury actions and going up against them without a motorcycle lawyer can severely alter your jury award, no matte how negligent the defendant was in causing the accident. Another reason to have a motorcycle lawyer is that motorcycle accidents often result in catastrophic injuries that leave the plaintiff in a position where the stresses of everyday life can be difficult. The process of litigating in court will often be too much to bear for an victim of a motorcycle accident, even one knowledgeable in the law. A motorcycle lawyer will also investigate possible claims against third parties for manufacturing defects that may have contributed to your injury. Maybe there was a defect in your motorcycle helmet that contributed to your injuries or the motorcycle was improperly designed or repaired. A motorcycle lawyer will know where to look and to investigate possible issues involving these third parties. If you are the defendant in a motorcycle accident you will represented by your insurance company. The insurance company will appoint a motorcycle lawyer to represent you. Depending on what damages you may be liable for you may want to seek other counsel. A motorcycle lawyer representing an insurance company is looking out for the best interest of the insurance company, not you. The motorcycle lawyer representing the insurance company has the goal of arguing for the dismissal of the case or the reduction of damages below the policy limit held by the defendant. If this is unmanageable the insurance companies lower doesn’t have much incentive to work hard in getting you the settlement offer available. This is when you want to hire a private motorcycle lawyer. The private motorcycle lawyer will work in your best interest to reduce your liability by showing that the plaintiff was contributory in his negligence, that the plaintiff wasn’t following motorcycle or motor vehicle regulation sand negotiate on your behalf to get a reduced settlement. What should I do when meeting with a motorcycle lawyer? When meeting with a potential motorcycle lawyer you should be prepared to have all documentation and information ready to provide to a potential motorcycle lawyer so that the motorcycle lawyer may properly analyze your case. This includes medical reports, police reports, names and addresses of witnesses, insurance information of both you and the other party, make and model of the vehicles and safety equipment involved and any and all other documentation that may be pertinent to the case. At that point motorcycle lawyers should be able to analyze your case and give you, at least some, answers about how to proceed. Motorcycle lawyers should be qualified to handle matters exclusively concerning motorcycle accidents. Every state has different motorcycle laws and your motorcycle lawyer should be knowledgeable about those laws, including helmet laws; motor vehicle laws; and other safety and driving regulations as well as the statute of limitations and filing requirements for personal injury actions. A motorcycle lawyer should be barred in the state and have extensive experience litigating, not only in the state, but also in the jurisdiction that the litigation will take place. You will want a motorcycle lawyer who has extensive experience negotiating with insurance companies, preferably the one that you will be litigating against, in personal injury actions. Most personal injury actions never go to court and for that reason you want a motorcycle lawyer who has received training and certification in negotiations skills and forms of alternate dispute resolution. A motorcycle lawyer will offer a number of varying fees which often depend on whether you are the plaintiff or the defendant. If you are the defendant motorcycle lawyers will usually charge a retainer fee followed by an hourly rate. If you are the plaintiff then the motorcycle lawyer will also want a retainer and then, at the completion of a settlement or positive jury award, will demand a percentage of the award, usually 30%. This is known as a contingency fee. What Questions to ask motorcycle lawyers? ■	How long have you been practicing? In this jurisdiction? ■	How many motorcycle accidents cases have you handles? ■	How often do you settle those cases? ■	How often have you gone gone to trial? ■	What are your fees? ■	What do you see as the issue in my case? ■	What do you see as the result? ■	Have you been taken classes or been certified in alternate dispute resolution strategies?